A combination of aerial photos show the farm of Richard Oswald near Langdon, Missouri after flooding March 20, 2019 and in the fall of 2018 at right. Relief groups are giving tetanus shots and handing out free meals and cleaning supplies near his farm in the Langdon-Rock Port area, about 100 miles (161 km) northwest of Kansas City. But what Oswald really needs is money. 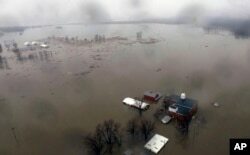 An aerial photo shows flooding along the Missouri River in Pacific Junction, Iowa, March 19, 2019. "I know we aim for bringing everything back up to where it was," said Rosalynn Days-Austin, a USDA emergency coordinator helping direct Federal Emergency Management Agency (FEMA) efforts in flood-affected areas. "Sometimes that's not always possible, for a variety of reasons, but the goal is definitely to help them bounce back from their loss." "What we're hearing, because of the snowpack and rain and the wet ground, is that farmers are going to be dealing with this throughout the spring. So we're in it for the long haul," said Jennifer Fahy, a spokeswoman for the group established by country singer and activist Willie Nelson. "We have national partners and coalitions within the state," said Maas, who is asking people to hold off donating more material goods, for now. "There will be stresses because we've not done anything of this magnitude. "I don't know of anything this widespread that has ever affected so many people in our service area," said Dan Erdmann, a spokesman for the group which helps family farms get through crises ranging from natural disasters to medical emergencies. While relief groups tend to urgent needs, farmers like Scott Olson say more federal relief money is needed at a time when low crop prices and high debt levels are limiting farmers' access to credit. He is counting on a farm relief bill in Congress for extra disaster compensation after he successfully lobbied in Washington for similar funds following 2011 flooding. "Flood insurance isn't going to cover this worth a darn. FEMA is worthless," said Olson, who farms 3,000 acres near Tekamah, Nebraska and runs a farm equipment business. "They don't have any money, nobody has any money."